The Angriest: Star Trek: The Next Generation: "The Quality of Life"
Star Trek: The Next Generation: "The Quality of Life"
It is 16 November 1992, and time for another episode of Star Trek: The Next Generation. The Enterprise travels to an orbital mining platform at Tyrus 7A, where the project leader Dr Farralon (Ellen Bry) demonstrates her innovative new maintenance robots known as 'Exocomps". When one of the Exocomps appears to malfunction Commander Data (Brent Spiner) takes the opportunity to investigate, and discovers indications that the Exocomps are not malfunctioning but are actually sentient beings. "The Quality of Life" does not really do anything wrong, but at the same time it does not do anything particularly great or out of the ordinary. Ultimately its only crime is that it is boring. There's little urgency in the episode, and it takes what feels like an age to reach a fairly predictable ending. Even the occasional attempts to generating tension fall extremely flat, because there is never a proper sense of jeopardy generated. One major problem with the episode is that the central question - can a human-made robotic creation be a sentient being - has already been addressed and fully answered all the way back in Season 2, in the rather exceptional "The Measure of a Man". What's more, that episode is even directly referenced here. There is no real progression of that debate, which leaves "The Quality of Life" hanging in a rather listless fashion. 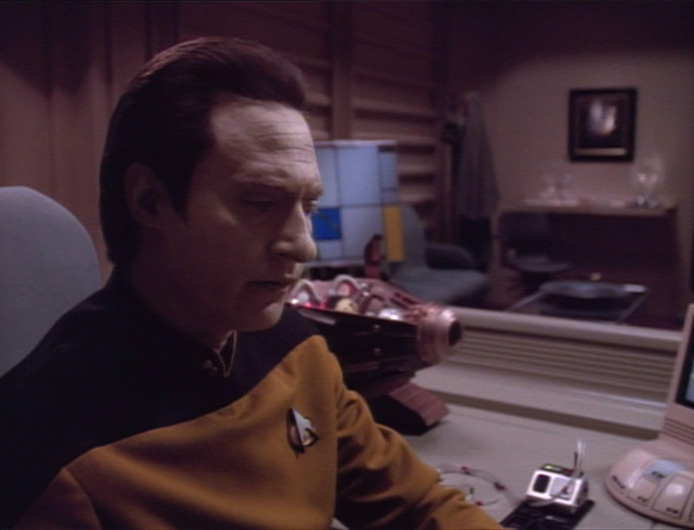 A climactic dilemma, where Data risks the lives of both Picard (Patrick Stewart) and La Forge (LeVar Burton) to protect the rights of the Exocomps, falls rather flat because we know there is no way Data's colleagues will die or that there will be any long-term consequences for Data either. It is just so half-hearted. It edges around the central question, but does not tackle it fully. It asks the occasional question, some of which are genuinely interesting. Data asks Dr Crusher (Gates McFadden) for a definition of life, and when she provides the standard response he points out that under those criteria he would not technically be a life form. A further interrogation of that debate, one specifically based around the Exocomps, would have been fascinating. The episode does not press any further. The Exocomps themselves have dated terribly as a visual effect. They look rather dumpy and unwieldy, and are visibly getting moved around on wires. As a potential new form of life, they are fairly dull to look at. Their creator, Farralon, is not much more interesting. Ellen Bry does her best, and infuses a little bit of charisma into the character, but in the end she's basically there for a lot of grumbling and frustrated shouting about not being able to exploit her own creations. The problems with her character are reflected in the episode as a whole: nothing here is organic, and all of the characters are shoe-horned around the plot. There are a few highlights. Spiner is on top form as a synthetic being, ostensibly the only one of his kind (the episode ignores Lore), fighting tooth and nail to protect the rights of something only he believes is alive. Gates McFadden gets some good supporting material. An opening poker game scene is relatively amusing. LeVar Burton has a beard again - he was granted permission to grow one over this episode and "A Fistful of Datas" because he wanted to have a beard for his wedding. None of it is worth the shortfalls of the rest, however. "The Quality of Life" is easily skipped over for better episodes down the line. Season 6 is stuck at five good episodes out of nine, with a quality ratio of 56 per cent.